Woo hoo!! My first Donors Choose project just got funded! ﻿ I started writing the project last fall and kept putting on the back burner all year, finally submitting it in the spring. I'm glad I finally pushed through and did it! I have so enjoyed all the wonderful ideas I have have seen on teacher blogs, Pinterest, and TPT, but I never had enough printer ink, cardstock, and laminating film to complete all the hands on activities I wanted for my students, not to mention a great space for organizing the materials. So I wrote up a proposal for it! Now it's funded and I can't wait to jump right in this fall! 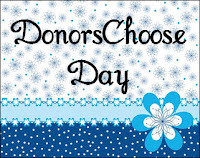 If you haven't heard of Donors Choose or are wondering what it's all about, you really must check it out! Donors Choose is a nonprofit organization that connects teachers with those who would like to donate funds for specific projects. How does it work? A teacher submits a project idea he or she would like to implement, complete with a list of necessary materials. The project is priced and posted on the Donors Choose website. Potential donors go to the website, look through the proposals and choose a project they would like to support. Once your project has received enough donations to cover the full cost of the project, Donors Choose sends you the materials. The Donors Choose website leads you step by step through the process, so it really is easy to submit an idea. They also have so many helpful resources on their site to help you create a great proposal. ﻿They also have a Facebook page, a newsletter, and a blog to provide more information, tips, and opportunities. There are a few great funding opportunities around right now. Laura Candler at Corkboard Connections Blog is such a fan of Donors Choose , she donates to a new project every week. She also has wonderful advice and a must see webinar. So, go check it out and get a proposal submitted this summer! Oh my gosh, I am in LOVE with DonorsChoose! I cannot say enough good things about that organization and website. It becomes addicting to submit proposals! My students have been able to go to a play, read leveled books, and have access to a number of games and activities thanks to awesome donors. Congrats on your funding!!! Thank you! I can see that this could be addictive- I have already started writing my next proposal! Congrats! I've gotten math and reading manipulatives and games funded through DonorsChoose. I see that you are in Richmaond, my youngest son goes to college in Lexington, Va (Wash. and Lee). Beautiful area! Glad you are following me, I'm now following you!